Sit back and relax and spend the day feeling nothing short of V.I.P as you are served up some swanky champagne cocktails. 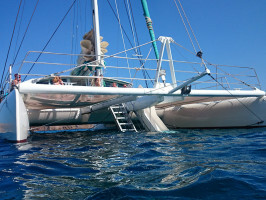 Take a stab at sailing the catamaran yourself as the crew are happy to show you the ropes. The main concept behind this trip is for you to get some peace and quiet. We are proud of the fact that people often refer to this top-notch tour as the “highlight of their holiday”. Our crew know how to look after you, that’s goes without saying! 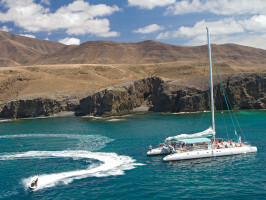 Once everybody is on board, we set sail for the beautiful beaches and natural park of Papagayo in the South of Lanzarote. 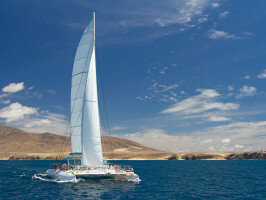 Sail along the coast past the village of Playa Quemada. You are more than welcome to have a go at sailing the Catlanza catamaran, the captain and crew love teaching people more about the way this boat works. Spend a day in touch with nature and watch closely and you might catch sight of the whales and dolphins swishing their way through the waters. 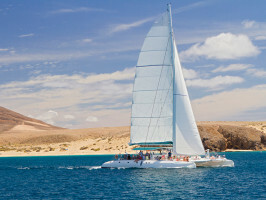 After a spot of sailing, we get to the beautiful golden beaches of Papagayo, we drop the anchor so that you can go for a swim or do a spot of snorkelling. You can either slowly saunter down the steps in to the sea or take the plunge on the super slide. If you’re up for it, you could jump on a jet ski and ride the waves. By now, you’re bound to have built up an appetite so get ready to tuck in to a lovely pasta lunch served with some salad and bread. Feel free to float over to the bar to quench your thirst throughout the day. German, English, French and Spanish. Hotel pick-ups from Costa de Teguise, Puerto del Carmen and Playa Blanca. If you are staying in Arrecife or Puerto Calero, make your way to the Local 1 in Puerto Calero Marina. We recommend bringing a swimsuit, biodegradable sun cream, sandals, a hat, a towel, a change of clothes and sunglasses. Guide/instructors speak: Spanish, English, German, French, Italian, Dutch, Portuguese and Polish.